The landscape is stunning and the wind constantly blows. The rolling hills of this little village in Puerto Rico are covered in tropical forest. The view from Elsa’s house is fabulous. Her husband has just died and her relatives have arrived to take their leave of him. Elsa observes with concern the relationship between her son-in-law and his daughter. Nonetheless, she continues to go about preparing food, hanging out the washing, feeding the chickens and tending the garden. Only her face gives away her unease when she discovers the incestuous relationship happening in her family. An economically filmed yet deeply impressive portrayal of a sensitive topic by this female director. 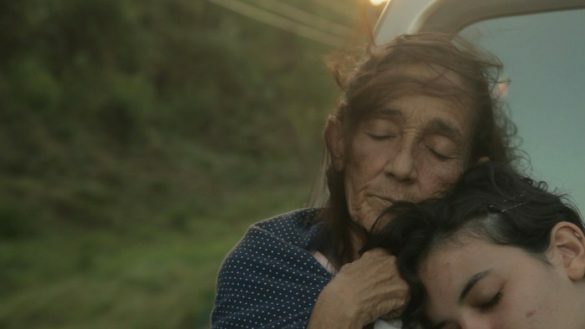 Writer/director Raisa Bonnet's naturalistic short film "Luna Vieja" sketches an almost wordless tale of the relationship between a young girl and her grandmother. Beautifully shot, it never tries to do too much within it's limited running time. Bonnet holds an MFA in Film and TV from New York University Graduate Film Program TISCH School of the Arts and a Bachelor of Audio Visual Communication from the University of Puerto Rico, Rio Piedras. She is currently producing her fifth short film, VENUS, as she teaches filmmaking at the University of Puerto Rico, Mayaguez Campus. Her most recent short film, Luna Vieja, traveled to prestigious film festivals as the Toronto International Film Festival and Berlin International Film Festival. These viewings opened the doors for Luna Vieja to be presented in many other festivals in cities like New York, Los Angeles, Utah, Seattle, Chicago, Guadalajara, La Habana, San Juan, Rincón, Port of Spain and Santo Domingo. Luna Vieja won best short film in the Seattle International Film Festival and Best Director and Actress in the Cinefiesta International Film Festival. In addition, Bonnet received a scholarship from the National Board of Review for this short film and traveled with NYU to the First Run Film Festival to present Luna Vieja at the Directors Guild of America for winning the 2nd prize award in the Graduate Film Competition. Bonnet is currently producing a self contained short film based on the first act of a feature film script written by her. The story won the RBC Focus Filmmakers’ Immersion Pitch Prize at the TTIFF and has been chosen by the Alliance Francaise to compete among Puerto Rican Filmmakers at the European Film Festival 2017.